The aim of this project was to establish an Inuit-led monitoring protocol for Polar bear. Polar bear require sea-ice to hunt their prey (predominantly seals) and with the increase in Arctic sea temperatures caused by global warming, the sea ice has diminished and Polar bear is threatened with starvation. Frequent monitoring is urgently required as a foundation for an effective management policy, but there’s a challenge. Current methods rely heavily on expensive and invasive immobilization and marking/collaring techniques which are unsustainable. We are combining three non-invasive and cost-effective monitoring strategies; FIT with Polar bear footprints, DNA identification of hair and blood samples (both non-invasively collected) and traditional Inuit footprint identification techniques. 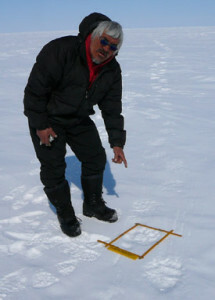 An expert local tracker finds a trail of Polar bear prints and begins to image them. Working in conjunction with a team of geneticists from Queen’s University in Ontario, the Nunavut Wildlife Management Board (NWMB) and Inuit traditional hunters and trackers, we spent four field seasons collecting data from the field site in Nunavut. We collected excellent footprint images and early indications are that the Polar bear footprint is amenable to identification using FIT. Furthermore, hair and blood samples are often available in the footprint, making data collection very quick and cost-effective.